Homemade Marshmallows, and What To Do With The Leftovers. It all started last week when we were planning for a s’mores dessert at our friends’ Eldad and Sheila’s house. Marshmallows are one of those foods that most sane people buy premade – like that other pillowy white food, tofu, and I suppose, graham crackers. While I do bake often, I have never even thought of making marshmallows from scratch and I didn’t even know if a home-cook could, or if you needed space-age technology and a huge factory. So I did some research, and I learned that while it’s not totally easy, it is feasible. 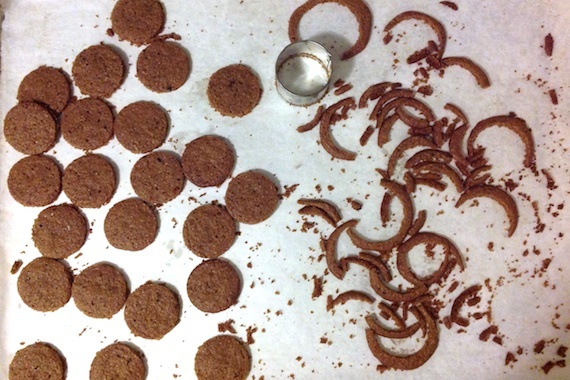 After looking through many recipes I settled on one from Brooklyn small-batch candy-makers Liddabit Sweets. Bonus: I recently bought their cookbook, and had been dying to make something from it! I have no pictures of the marshmallow-making process because most of the time my hands were way to sticky with either caramel or meringue or I was too busy using my candy thermometer. The technique is very scientific, involved ingredients I’m not at all used to working with, and since it’s been a long time since I’ve rigorously followed a recipe, I was a bit overwhelmed. Therefore, no documentation. But basically, a caramel is made with sugar, corn syrup and water. I initially balked at corn syrup, thinking WTF?! I’m not going to purchase that devil’s nectar! But after reading about it, I learned that it IS different from the high-fructose corn syrup that permeates industrial foods, and that it is necessary when making some forms of caramel, as it prevents the sugar from crystalizing. I figured since I was soooo out of my league already, I should just buy the corn syrup and follow the recipe as is. So, the caramel is made and then drizzled into a meringue, which softened gelatin is then added to. OK – let’s talk gelatin. I am not a fan, and I searched far and wide for a reputable agar-agar or other-thickener-based marshmallow recipe. When I didn’t find one that seemed reliable, I decided to throw caution to the wind, and go the way of the corn syrup, chalk this up to a once-in-a-cooks-life experimentation and use the gelatin. I schlepped to Aaron’s Kissena Farms kosher supermarket to buy Kosher gelatin, and while it didn’t make me feel much better, it did improve the ick factor by a bit. Once the marshmallow ingredients were all mixed and I was running my stand mixer at high for what felt like forever (those things are LOUD! ), I turned out the fluff into a sheet pan that was greased and coated with a corn starch/powdered sugar mixture. Once the fluff was all smoothed into the pan, another layer of corn starch/powdered sugar was added on top, and the marshmallows set at room temperature overnight. The thing was, I had a bunch of fluff leftover…. not an awful situation to find oneself in, but I had to figure out something to do. So I decided to pipe out the rest into little macaron-shaped marshmallows on another parchment lined baking sheet. 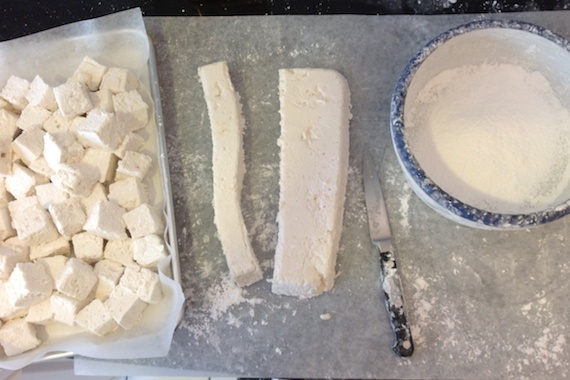 Once the fluff set overnight, I cut the congealed fluff into cubes and coated with more of the corn starch/powdered sugar mixture, and they finally resembled the marshmallows you buy in the store. Long story short, we did make s’mores with them, and while the my version was okay, they weren’t great. The texture wasn’t what we were used to – they were a bit ‘loose’, like they didn’t set up as well as they could have. AND we only ate, like 10 or 15 of them, and since the recipe made over 100, I had to figure out something to do with the leftovers. Hence, Mallomars. 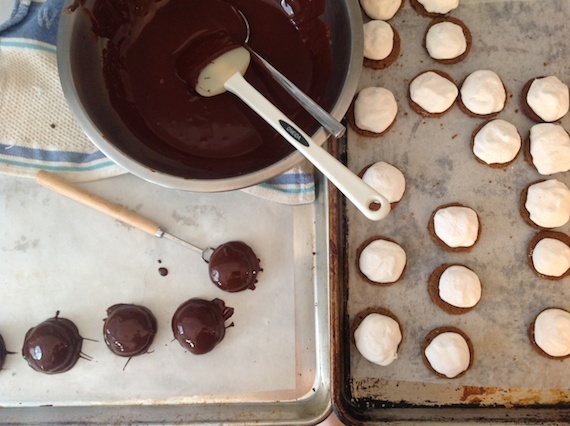 A graham-cracker-esque cookie base was made (basic shortbread but with a bit-o-molasses, extra vanilla, and baking soda), and cut into little rounds the size of the piped-out mallows. Then I realized that I had to temper chocolate for the coating. Yikes! I had one experience with tempering chocolate up until now: When I was 19 I worked in a classic French restaurant under a master chocolatier, Didier Berlioz, who could temper chocolate in his sleep, without any thermometers. 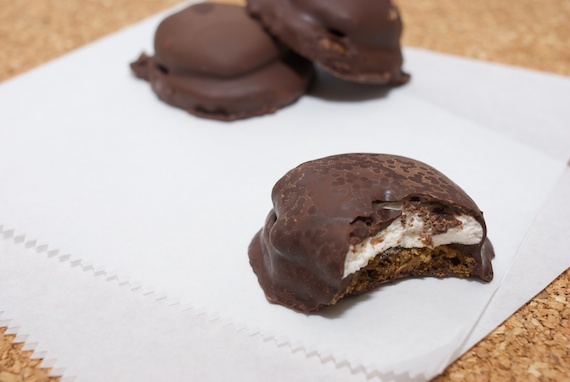 While I helped him, I had never tempered on my own, but I had to now, there was no way around it – it was the final necessary step to complete my mallomars. Tempering chocolate is SO out of the scope of this blog post, especially considering I didn’t do it correctly. 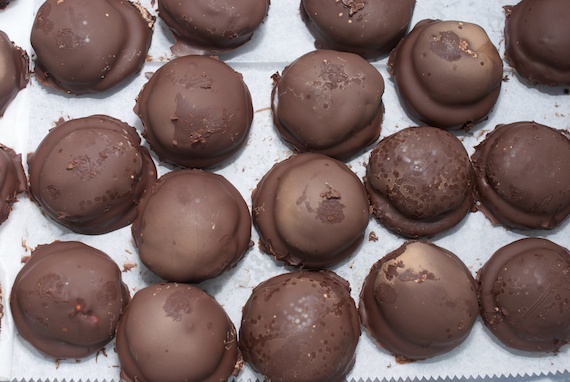 After reading what Harold McGee, the Liddabit cookbook, wikipedia, and Martha Stewart all had to say about tempering, I thought I was successful, so after I dipped the mallomars, I left them out on the counter to set, went to yoga, and came back to find them still tacky. So I hopped on twitter and enlisted the help of an expert: Gail from One Tough Cookie suggested I place them in the refrigerator, which I did, and voila (thanks Gail!) – the chocolate set – YAY! But, it has bloomed – BOO! Bloomed chocolate means that the cocoa fat has separated out and risen to the surface of the chocolate, in funky polka-dots. Bloomed chocolate is completely safe to eat, but it is undesirable, but what are you gonna do, right?! They still taste great. This really was a first, and although there were some fumbles along the way, I most likely will never make these again. I mean, I could be wrong, but…. probably not. And now to eat them and/or give them away in time before Passover starts…. I can’t speak to the mallomars (yet – I hope I will have the chance to sample them), but I can attest to the deliciousness of the marshmallows. They were really great. I love the ambition in making marshmallows, tempering chocolate, etc. It’s inspiring! Blown away by the dedication — the extensive research, the enlistment of support, the refusal to waste — the experimentation, the honesty and, what appears to be, the beautiful outcome. You are so brave to tackle a project like this. Tempering chocolate isn’t something I do well. Bet they taste great. Thanks everyone! 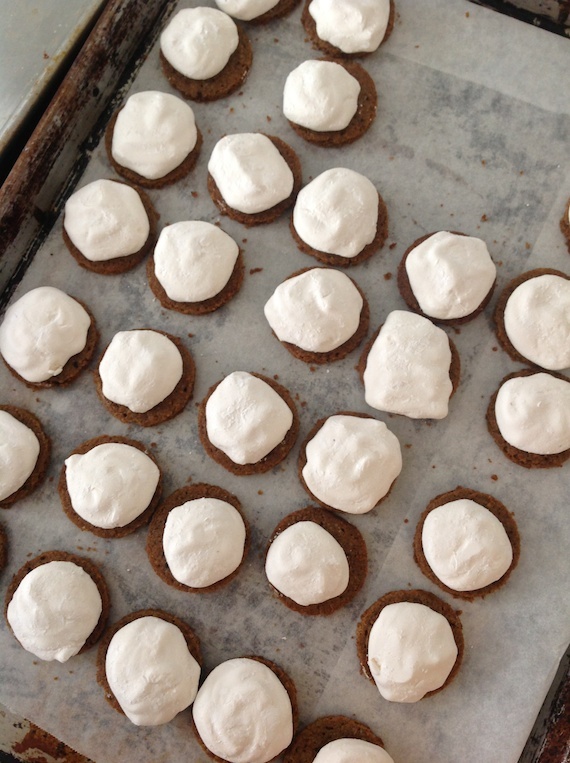 It was a labor of love, I must say… Thankfully they DO taste good!